Roof Shampoo is the safest, most effective roof cleaning method available. Diamond Roofing, Remodeling & Roof Shampoo is proud to be the premier roofing specialist and general contractor for homeowners throughout the 7 county metro area. We offer complete roofing services—including eco-friendly Roof Shampoo®–in addition to expert remodeling and improvement projects. Contact us today for a free estimate! Owning a home is an investment. When it comes time to reinvest in your space or maintain its core features—like the roofing, siding or interior rooms—make sure you’re trusting Diamond Roofing, Remodeling & Roof Shampoo with the job. We’re the foremost authority on roofing services and home improvements in the Twin Cities, Minneapolis and St. Paul, bringing unparalleled workmanship to every single project. From an eco-friendly Roof Shampoo® treatment to a brand-new floorplan for your kitchen or bathroom, our goal is to help you maintain a home that you can be proud of and one that will pay dividends on your comfort and quality of life. No matter the size of your home or the demands of the project, we’ll deliver excellence, no matter what. Though we’re well-trusted as a general contractor in Minneapolis, our specialty is roofing and exterior work. From storm damage repairs to new TPO roofing, roof cleaning to minor repairs, we handle any and all roofing needs you might have. We can even assist you with any insurance claims from storm damage, to expedite repairs and save you the stress of dealing with your insurance company! Our roofing contractors in Minneapolis operate quickly and use only the best products, giving you peace of mind about your roof—no matter how big it is or how many years it’s protected your home. Don’t let your home fall victim to age, degradation, weathering or neglect. Contact Diamond Roofing, Remodeling & Roof Shampoo today for a reliable reinvestment in your home. For roof cleaning, we’re the area’s only provider of eco-friendly solutions from Roof Shampoo®. Our business is fully licensed and insured for roofing work and a Minnesota State Licensed General Contractor. Our business proudly maintains a superior A-plus rating with the Better Business Bureau (BBB). We offer free consultations on all projects, so you have an idea of cost and timeline upfront, before work begins. Hail damage hampering your roof? Problems with debris or staining? We’re your complete roofing experts, providing everything from repairs to eco-friendly Roof Shampoo®! "Chris and his team did a fantastic job cleaning our roof and gutters. There was no fooling around they got the job done quickly and profes..."
"Chris responded in a timely manner when I needed my roof cleared after we got a ton of snow. 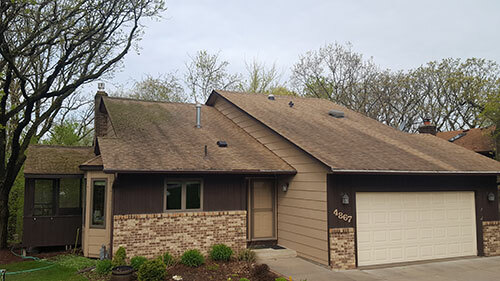 He's professional and knowledgeable, I will def..."
"Chris was extremely easy to work with and did an excellent job shampooing the roof, cleaning the siding and soffits as well as noticing and ..."
"My vinyl wrapped house looks brand new! Very friendly, informed and professional staff willing to and encouraged any questions I had. They e..."
"Chris & his team are AWESOME! They cleaned the roof & siding. Excellent job & great to work with. We are very pleased with the outcome. HIGH..."